Cold sores are caused by Herpes Simplex-1, a virus that most adults have contracted throughout the course of their lives. It can be contagious and is spread through direct or indirect contact with an infected party. 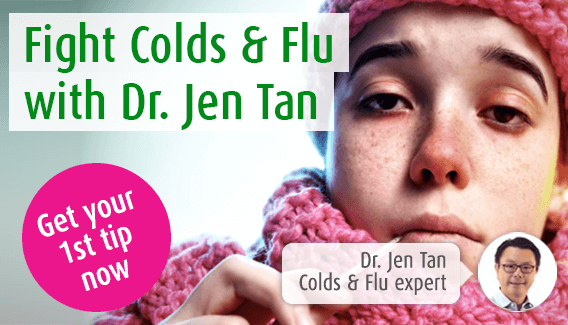 In this page, our immune system expert Dr. Jen Tan talks about the underlying causes of the HSV1 virus and what triggers can awaken dormant cold sore infections. Cold sores are caused by a virus known as Herpes Simplex 1 (HSV-1). The majority of adults carry the virus, having been been infected by this virus at some stage in life. The virus is spread during close personal contact, through kissing or sharing of items that pass over the lips such as cutlery, lipsticks, face creams or towels. What is not commonly known, however, is that cold sore viruses are usually acquuired in early childhood - often between the ages of 3 and 5, when the virus is transferred from parents, siblings or family members through a kiss or close contact. This is called the primary infection. More often than not, this initial infection does not give rise to any symptoms and it is not unusual that it passes unnoticed. After this first infection, the cold sore virus settles in a nearby nerve and remains there for life, lying dormant (or inactive) until it is reactivated. The virus becomes active due to a number of trigger factors. Most people encounter the cold sore virus (HSV-1) as children – this is called the primary infection. After entering the body, the cold sore virus travels along sensory nerve pathways and goes into a latent or hibernation phase in the sensory nerve ganglion. The virus doesn't affect the normal functioning of the nerve, and remains there, lying dormant until it is reactivated by an external trigger factor. Once the cold sore virus has been reactivated, a secondary infection occurs and cold sore symptoms develop. Secondary infection by the cold sore virus leads to what we recognise as the symptoms of a cold sore. This starts with an itching or tingling around the lips, followed by the development of small red spots and subsequently, painful blisters. Blisters then break open – at this stage, millions of cold sore viruses are released into the environment and may infect those around. Eventually, the blister scabs over and heals. There are many trigger factors known to cause reactivation of the cold sore virus. These include sunlight and UV (tanning) lamps. Weakening of the immune system as a result of overwork, lack of sleep, stress can also be trigger factors. In addition, infections by cold viruses can also temporary weaken the immune system as the body fights off these invaders – for some, cold sores occur together with cold or flu infections and this is one reason for its name. Read more about the causes of cold sores.